Youth Helmet Laws in the U.S.
I’m always surprised by how few people buy a helmet for their child at the same time they buy a bike. Even for kids on balance bikes, a helmet is not only critical for keeping them safe, it is also required by law in many states. We often hear about the children’s helmet law in California, but in fact 22 states plus the District of Columbia have laws in place to protect our most vulnerable riders. At the end of this post, I’ve listed a state-by-state overview of those laws. It’s my opinion that helmet laws for children are a positive thing. My two-year old already points out when he sees other kids on bikes without helmets (a common sight). While he’s happy to wear his helmet today, I worry that there will be a time in the not too far off future when he decides he doesn’t want to wear a helmet in order to fit in with friends. 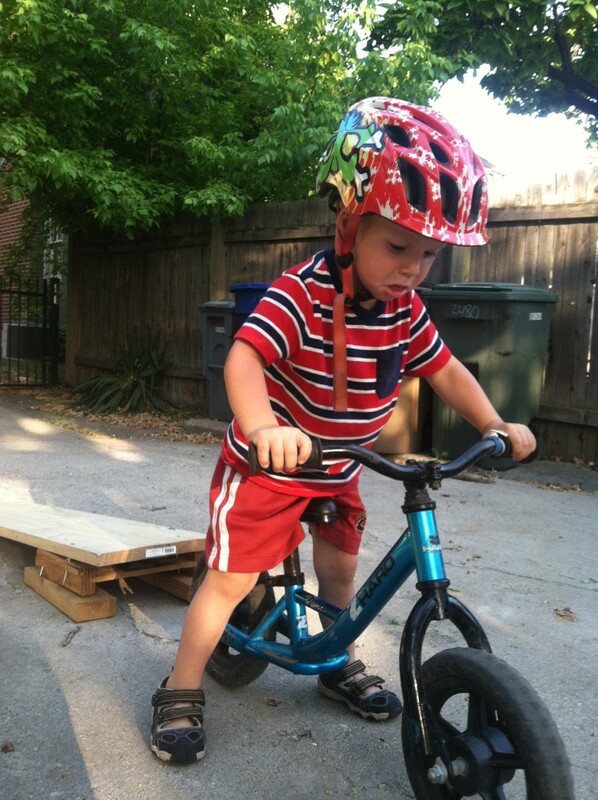 Helmet laws help protect against this kind of peer-pressure (at least for younger kids). 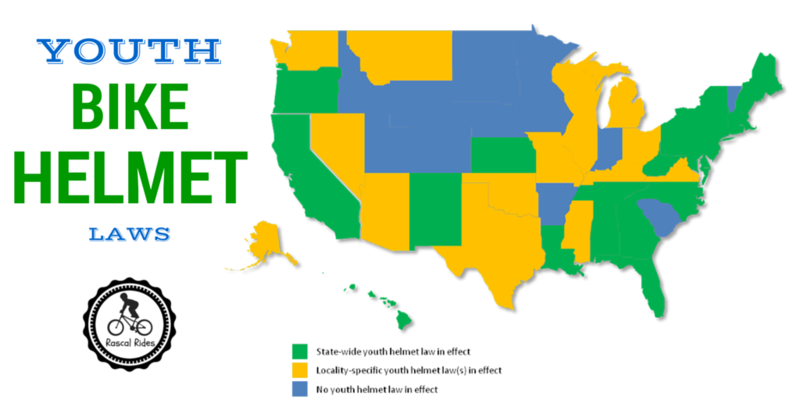 State Laws adopted over the past two decades that require youth to wear helmets when riding a bicycle reduced youth bicycling fatalities by about 19 percent, increased helmet use by 20-34 percent, and (unintentionally) reduced bicycling by 4-5 percent. I believe, however, that these reductions could be mitigated by cultural shifts (in which wearing helmets are the “norm), and by providing free or subsidized helmets to at-need children. Whatever your opinions are on youth helmet laws, if you have a little one on a bike, it is important to understand the legal requirements in your area. Here is a quick overview of children’s helmet laws across the U.S. If your state isn’t listed, it means there are NO laws in place. Note: If you’re looking for a helmet for your toddler or young child, check out this list of the best options on the market. (Please note: I am not a lawyer, nor do I have any legal background. This is my best understanding of the laws as they exist today). Alabama: State law requires all riders under 16 years of age to wear a helmet when on a bicycle. Some localities require helmets for all ages. Alaska: There is no state-wide law. Anchorage and Kenai require helmets for those under 16 years of age. Bethel, Juneau, and Sitka require helmets for those under 18 years of age. Arizona: There is no state-wide law. Flagstaff, Pima County, Sierra Vista, Tucson, and Yuma all require helmets for those under 18 years of age. California: State law requires all riders under 18 years of age to wear a helmet when on a bicycle. In addition to bicycles, all youth under 18 are also required to wear a helmet when on scooters, skateboards, and inline skates. Here’s a good overview of the California Bicycle Helmet Law including information on fines. Connecticut: State law requires all riders under 16 years of age to wear a helmet when on a bicycle. Some localities require helmets for all ages. Delaware: State law requires all riders under 18 years of age to wear a helmet when on a bicycle. In addition to bicycles, all youth under 18 are also required to wear a helmet when on scooters, skateboards, and inline skates. District of Columbia: State law requires all riders under 16 years of age to wear a helmet when on a bicycle. In addition to bicycles, all youth under 16 are also required to wear a helmet when on scooters, skateboards, and inline skates. Florida: State law requires all riders under 16 years of age to wear a helmet when on a bicycle. Private property (driveways, for example) are excluded. Georgia: State law requires all riders under 16 years of age to wear a helmet when on a bicycle. Hawaii: State law requires all riders under 16 years of age to wear a helmet when on a bicycle. Illinois: There is no state-wide law. Cicero, Inverness, and Skokie all require helmets for those under 16 years of age. Barrington requires helmets for those under 17 years of age. Kansas: State law requires all riders under 16 years of age to wear a helmet when on a bicycle. In addition to bicycles, all youth under 16 are also required to wear a helmet when on scooters, skateboards, and inline skates. Kentucky: There is no state-wide law. Louisville requires helmets for those under 17 years of age, and for riders of any age within the Louisville Extreme Park. Louisiana: State law requires all riders under 12 years of age to wear a helmet when on a bicycle. Maine: State law requires all riders under 16 years of age to wear a helmet when on a bicycle. Maryland: State law requires all riders under 16 years of age to wear a helmet when on a bicycle. In addition to bicycles, all youth under 16 are also required to wear a helmet when on scooters, skateboards, and inline skates. Montgomery country requires all riders under 18 years of age to wear a helmet when on a bicycle. Sykesville requires a helmet for riders of all ages. Massachusetts: State law requires all riders under 17 years of age to wear a helmet when on a bicycle. In addition to bicycles, all youth under 17 are also required to wear a helmet when on scooters, skateboards, and inline skates. Michigan: There is no state-wide law. Adrian requires all riders under 15 years of age to wear a helmet when on a bicycle. Farmington Hills requires all riders under 16 years of age to wear a helmet when on a bicycle, scooter, skateboard, or inline skates. East Grand Rapids requires all riders under 18 years of age to wear a helmet when on a bicycle. Kensington Metropark requires a helmet for riders of all ages. Mississippi: There is no state-wide law. Hernando requires all riders under 17 years of age to wear a helmet when on a bicycle, scooter, skateboard, or inline skates. Starkville requires riders of all ages to wear a helmet when on a bicycle, scooter, skateboard, or inline skates. Missouri: There is no state-wide law. St. Louis County requires all riders/passengers between the ages of 1 and 16 to wear a helmet when on a bicycle, scooter, skateboard, or inline skates. (Note: There is an important distinction between this law and most of the others. The St. Louis County law does not apply to infants under 1 year of age, allowing parents to legally ride with babies who are not old enough to wear a helmet. Read more about riding with babies in this blog post). Some localities within St. Louis County require helmets for riders of all ages. Columbia requires all riders under 16 years of age to wear a helmet when on a bicycle, scooter, skateboard, or inline skates. St. Charles requires all riders under 16 years of age to wear a helmet when on a bicycle. Montana: There is no state-wide law. Billings requires all riders under 16 years of age to wear a helmet when on a bicycle. Nevada: There is no state-wide law. Both the Duckwater Indian Reservation and Reno/Sparks Indian Colony require all riders under 17 years of age to wear a helmet when on a bicycle. New Hampshire: State law requires all riders under 16 years of age to wear a helmet when on a bicycle. New Jersey: State law requires all riders under 17 years of age to wear a helmet when on a bicycle. In addition to bicycles, all youth under 17 are also required to wear a helmet when on scooters, skateboards, and inline skates. New Mexico: State law requires all riders under 18 years of age to wear a helmet when on a bicycle. In addition to bicycles, all youth under 18 are also required to wear a helmet when on tricycles, scooters, skateboards, and inline skates. New York: State law requires all riders under 14 years of age to wear a helmet when on a bicycle. Guilderland requires all riders under 19 years of age to wear a helmet when on a bicycle, scooter, skateboard, or inline skates. Suffolk County and Onodaga County-Syracuse require all riders under 18 years of age to wear a helmet when on a bicycle. Some localities require helmets for all ages. North Carolina: State law requires all riders under 16 years of age to wear a helmet when on a bicycle. In addition, Charlotte and Cornelius require all youth under 16 years of age to wear a helmet when on scooters, skateboards, and inline skates. Black Mountain and Boone require riders of all ages to wear a helmet. Ohio: There is no state-wide law. Strongsville requires all riders under 12 years of age to wear a helmet when on a bicycle. Dayton requires all riders under 13 years of age to wear a helmet when on a bicycle. Brooklyn, Euclid, and South Euclid require all riders under 14 years of age to wear a helmet when on a bicycle. Akron, Beachwood, Bexley, and Blue Ash require all riders under 16 years of age to wear a helmet when on a bicycle. Cincinnati, Enon, Kettering, and Marietta require all riders under 16 years of age to wear a helmet when on a bicycle, scooter, skateboard, or inline skates. Madeira and Waynesville require all riders under 17 years of age to wear a helmet when on a bicycle, scooter, skateboard, or inline skates. Columbus requires all riders between 1 and 17 years of age to wear a helmet when on a bicycle, scooter, skateboard, or inline skates. (Note: There is an important distinction between this law and most of the others. The Columbus law does not apply to infants under 1 year of age, allowing parents to legally ride with babies who are not old enough to wear a helmet. Read more about riding with babies in this blog post). Centerville, Lakewood, and Pepper Pike require all riders under 18 years of age to wear a helmet when on a bicycle. Brecksville and East Cleveland require all riders under 18 years of age to wear a helmet when on a bicycle, scooter, skateboard, or inline skates. Shaker Heights requires all riders over 5 years of age to wear a helmet when on a bicycle. Oklahoma: There is no state-wide law. Norman requires all riders under 18 years of age to wear a helmet when on a bicycle. Oklahoma City requires riders of all ages to wear a helmet when on a bicycle. Oregon: State law requires all riders under 16 years of age to wear a helmet when on a bicycle. In addition to bicycles, all youth under 16 are also required to wear a helmet when on scooters, skateboards, and inline skates. Pennsylvania: State law requires all riders under 12 years of age to wear a helmet when on a bicycle. Rhode Island: State law requires all riders under 16 years of age to wear a helmet when on a bicycle. In addition to bicycles, all youth under 16 are also required to wear a helmet when on scooters, skateboards, and inline skates. Tennessee: State law requires all riders under 16 years of age to wear a helmet when on a bicycle. Texas: There is no state-wide law. Coppell and Southlake require riders under 15 years of age to wear a helmet when on a bicycle. Bedford requires riders under 16 years of age to wear a helmet when on a bicycle. Benbrook requires riders under 17 years of age to wear a helmet when on a bicycle. Arlington, Austin, Dallas, Fort Worth, and Houston requires riders under 18 years of age to wear a helmet when on a bicycle. Virginia: There is no state-wide law. The following localities require riders under 15 years of age to wear a helmet when on a bicycle: Albermarle County, Alexandria, Amherst County, Arlington County, Blacksburg, Clarke County, Fairfax County, Falls Church, Floyd County, Front Royal, Hampton, Harrisonburg, James City County, Luray, Manassas, Manassas Park, Newport News, Norfolk, Orange County, Petersburg, Prince William County, Radford, Roanoke, Salem, Stanford County, Vienna, Virginia Beach, Williamsburg, Wise, York County. Washington: There is no state-wide law. Orting requires riders under 17 years of age to wear a helmet when on a bicycle. Poulsbo requires riders under 18 years of age to wear a helmet when on a bicycle. Seatac requires riders of all ages over 1 year to wear a helmet when on a bicycle. (Note: There is an important distinction between this law and most of the others. The SeaTac law does not apply to infants under 1 year of age, allowing parents to legally ride with babies who are not old enough to wear a helmet. Read more about riding with babies in this blog post). The following localities require riders of all ages to wear a helmet when on a bicycle: Aberdeen, Auburn, Bainbridge Island, Bellevue, Bremerton, Des Moines, DuPont, Duvall, Eatonville, Enumclaw, Fircrest, Gig Harbor, Hunts Point, Kent, King County, Lakewood, Milton, Pierce County, Port Angeles, Port Orchard, Puyallup, Renton, Seattle, Snoqualmie, Spokane, Steilacoom, Tacoma, University Place, and Vancouver. West Virginia: State law requires all riders under 15 years of age to wear a helmet when on a bicycle. Clarksburg, South Charleston, and St. Albans require riders under 18 years of age to wear a helmet when on a bicycle. Morgantown requires riders of all ages to wear a helmet when on a bicycle. Wisconsin: There is no state-wide law. Port Washington requires all riders under 17 years of age to wear a helmet when on a bicycle. You are missing some states. Where should I go to find information on Wyoming laws? Wyoming doesn’t have any state or local helmet laws.